A snapshot of the Detail Devil’s work (copyediting, formatting, manuscript preparation and typesetting) . . .
Critical indigenous rights studies. Abingdon, UK: Routledge. Human-centred education: A practical handbook and guide. Abingdon, UK: Routledge. The Palgrave Macmillan international handbook of women and outdoor learning. London, UK: Palgrave Macmillan. The globalisation of higher education: Developing internationalised education in research and practice. London, UK: Palgrave Macmillan. Becoming critical teacher educators: Narratives of disruption, possibility, and praxis. Abingdon, UK: Routledge. Universal design for learning in the early childhood classroom: Teaching children of all languages, cultures, and abilities, birth – 8 years. London, UK: Taylor & Francis. Education to better their world: Unleashing the power of 21st-century kids. New York, NY: Teachers College Press. Living with bariatric surgery: Managing your mind and your weight. Abingdon, UK: Routledge. Assessing mathematical literacy: The PISA experience. Switzerland: Springer. Teaching English at Japanese universities: A new handbook. Abingdon, UK: Routledge. Debates in computing and ICT in education. Abingdon, UK: Routledge. Redman, C. (2014). The Melbourne Graduate School of Education Master of Teaching: A clinical practice model. In M. Jones & J. Ryan (Eds. ), Successful teacher education (pp. 11-29). Rotterdam, The Netherlands: Sense Publishers. Singh, M. (2018). Learning to theorise from Bourdieu: Using Zhōngwén (中文) in English for research publication purposes. In G. Mu, K. Dooley & A. Luke (Eds). Bourdieu and Chinese education: Inequality, competition, and change (pp. 228-252). New York, NY: Routledge. Singh, M. (in press). Postmonolingual doctoral education, languages-and-knowledge transfer and innovative multilingual migrant labour’. In V. Anderson & H. Johnson (Eds. ), Migration, education, and translation: Cross-disciplinary perspectives on human mobility and cultural encounters. 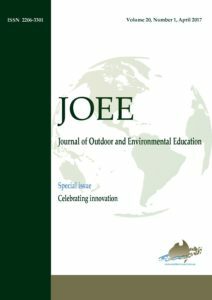 Managing Editor, Journal of Outdoor & Environmental Education (Editor-in-Chief A/Prof. John Quay, University of Melbourne, Australia). Dobud, W., & Harper, N. J. (2018). Of Dodo birds and common factors: A scoping review of direct comparison trials in adventure therapy. Complementary Therapies in Clinical Practice, 31, 16-24. Yager, Z., Gray, T., Curry, C., & McLean, S. A. (2017). Body dissatisfaction, excessive exercise, and weight change strategies used by first-year undergraduate students: comparing health and physical education and other education students. Journal of Eating Disorders, 5(10). Gray, T., Hall, T. J., Downey, G., Jones, B. T., Truong, S., Power, A., . . . Sheringham, C. J. (2016). Enhancing Programs Integrating Tertiary Outbound Mobility Experiences (EPITOME): Final report. Penrith, NSW: Western Sydney University. doi:10.4225/35/588805fa8dd2. Redman, C., Cooper, M., & Boltrell, C. (2014). Rural Youth Aspirations project: Final report March 2014. The University of Melbourne, Australia.